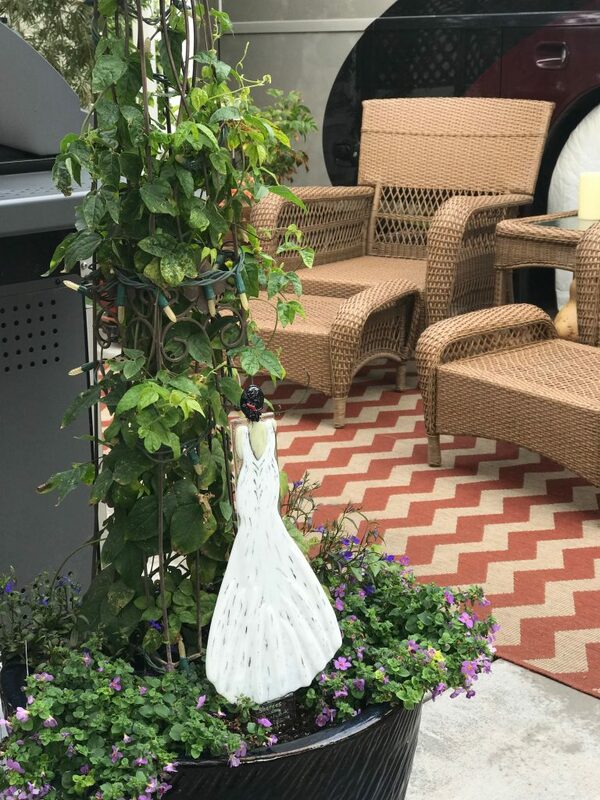 I love to Garden and enjoy watching all the changes flowers go through from Spring to Fall. 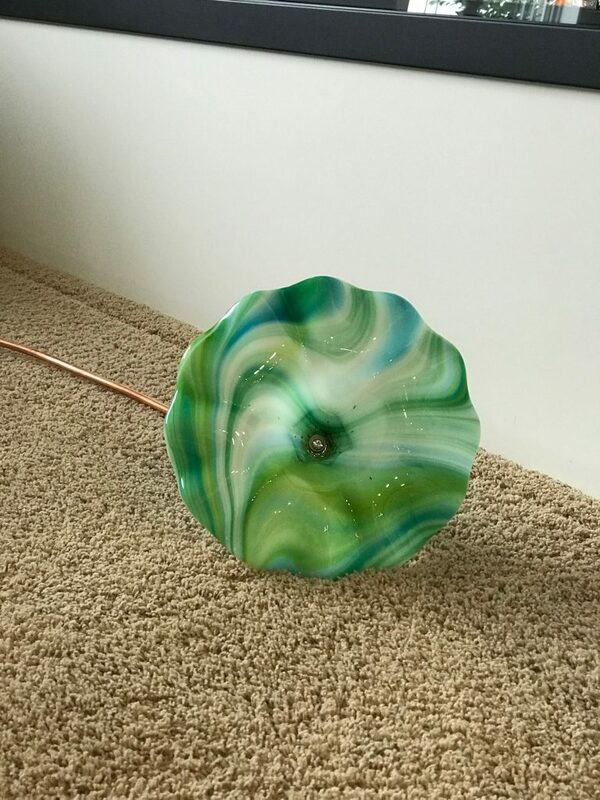 While in Arizona a few years back we were able to go see a Dale Chihuly Glass Exhibit – so beautiful!!! 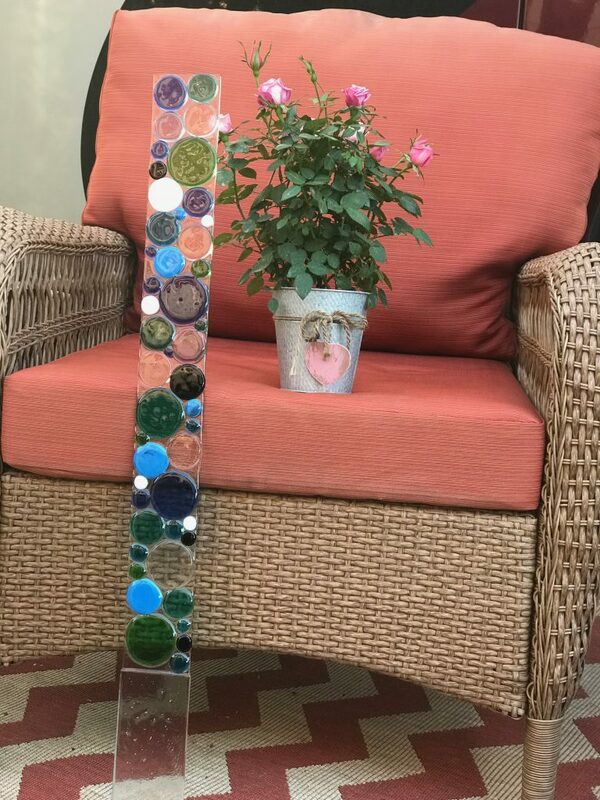 It really inspired me to start making Garden Stakes for my own garden, and then I started making flowers, mushrooms, window hanging. 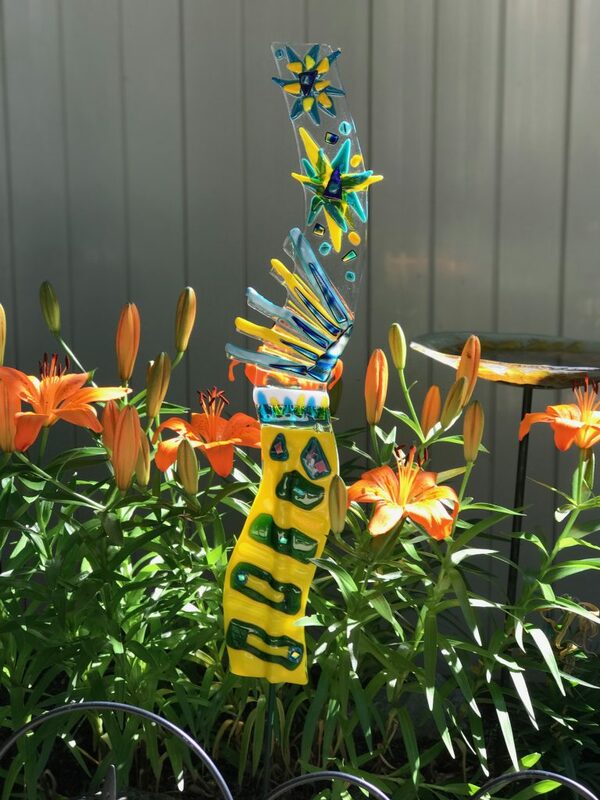 You can have your Garden Stakes long or short, wide or thin – you can really use your imagination and be creative with all shapes and colours. 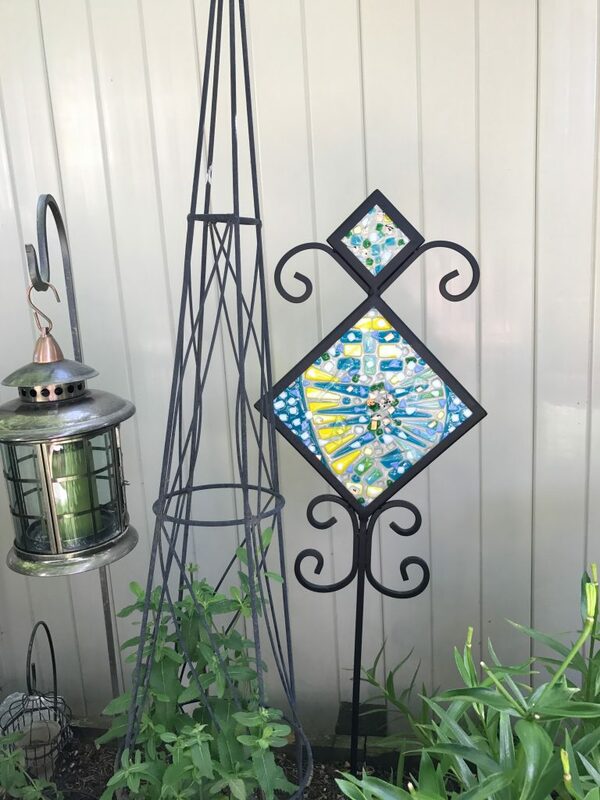 It always gives me joy just to look at the pieces in my garden!!! 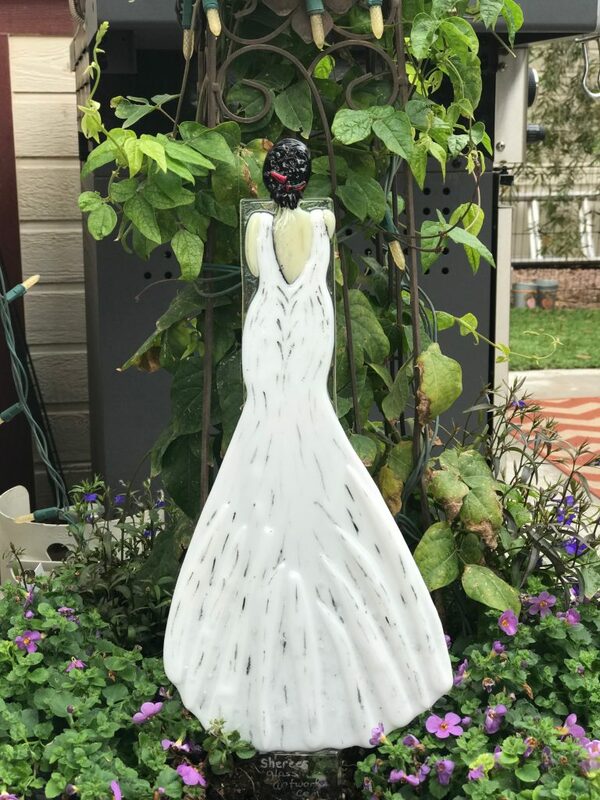 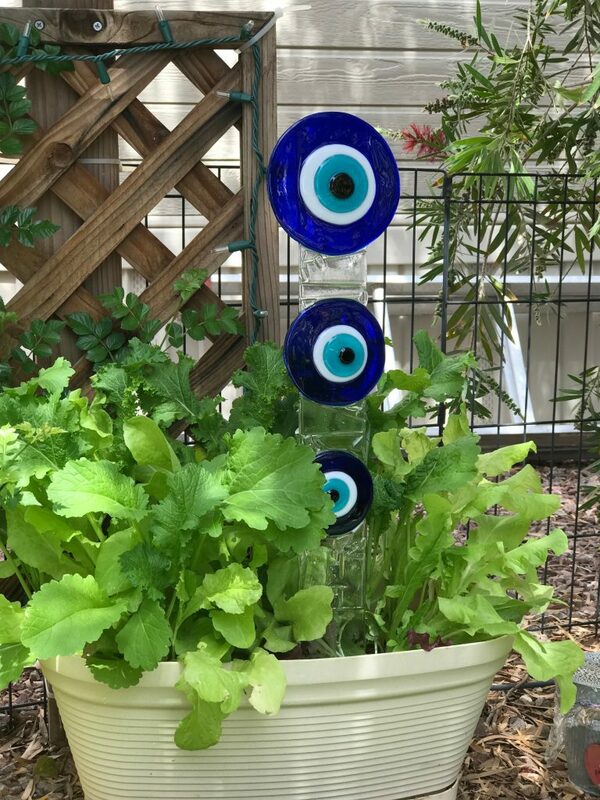 My Customer asked me to make her a Turkish Evil Eye Garden Stake. 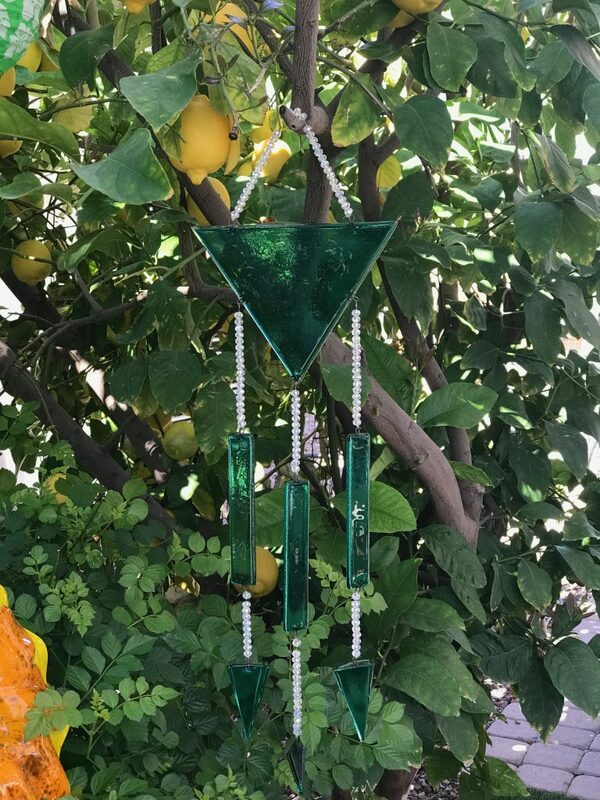 I had never heard of this before and asked her to tell me what it is all about. 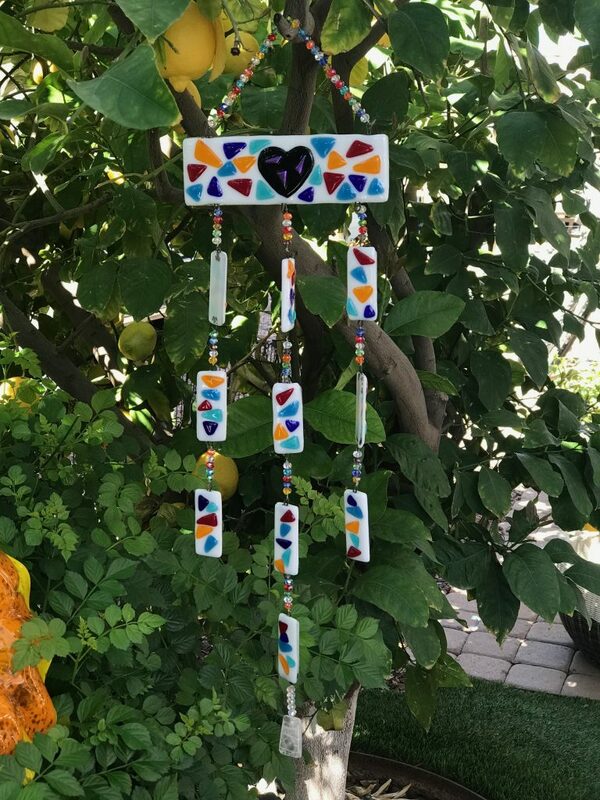 They had lived in Turkey for quite a few years and the Turkish people believe that if you have a Evil Eye at your entrance to your house and in your car that it will ward of Evil. 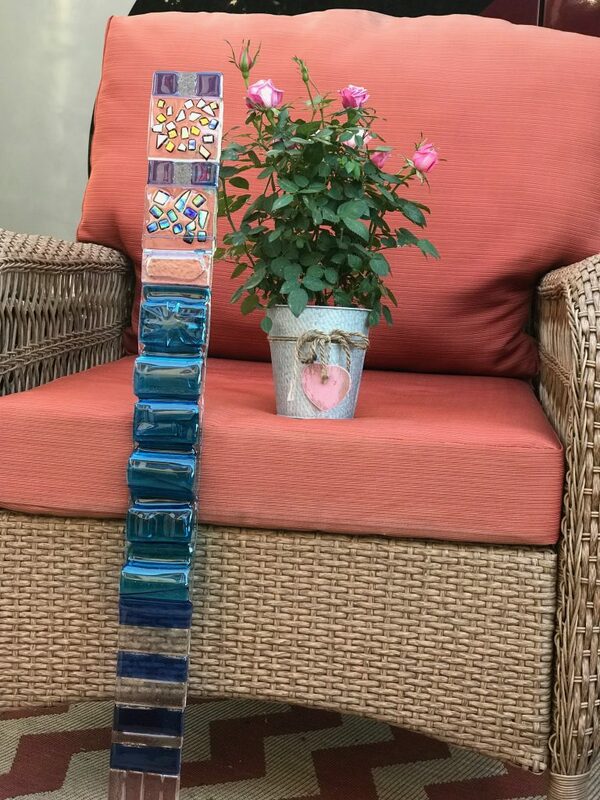 I made this one below and she loved it so much she had me make another one for her daughter. 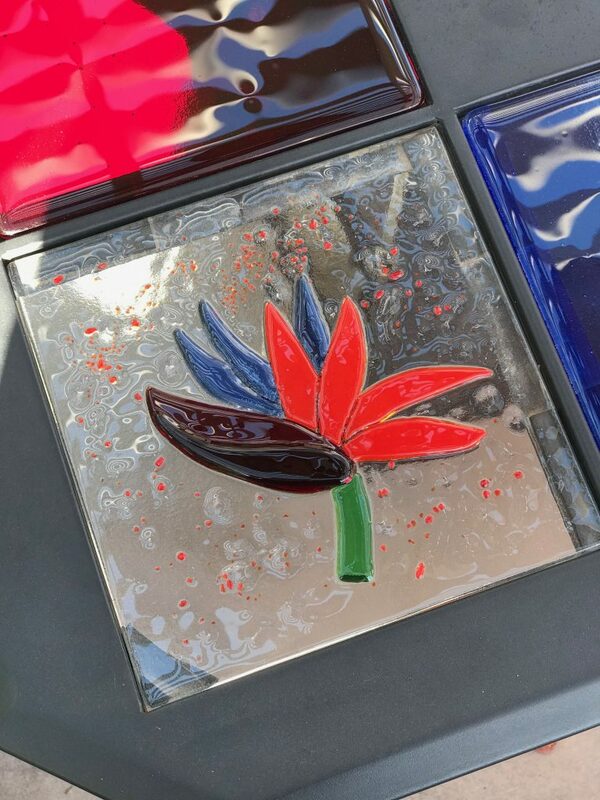 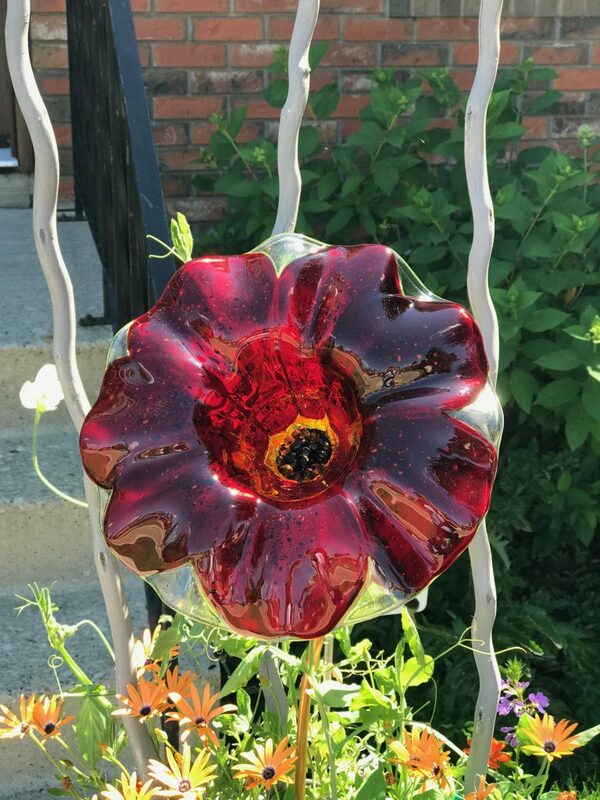 The Fusion Glass Flowers are one of the Best Sellers I have – people see them and love them immediately. 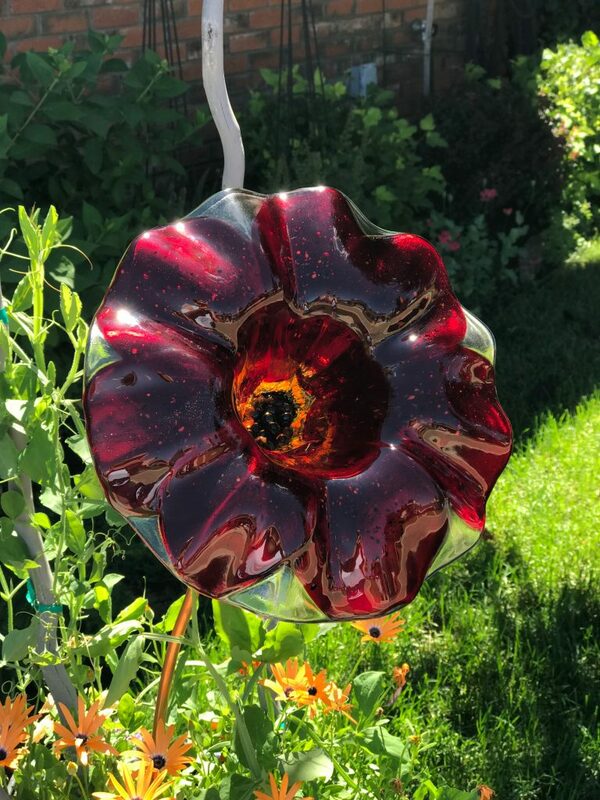 The Flowers below have already been sold but I wanted to put them on this page so you can see them. 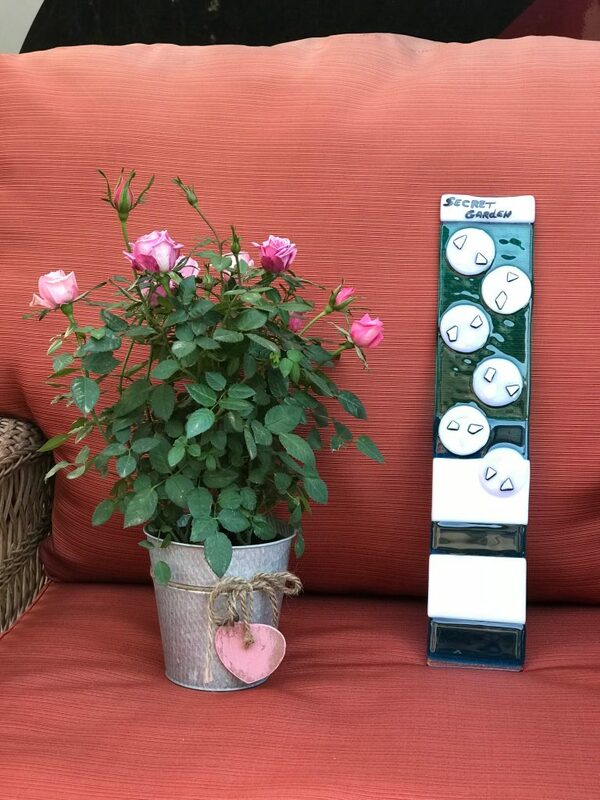 My question to you is what colour would you like your flower to have and then I go from there. 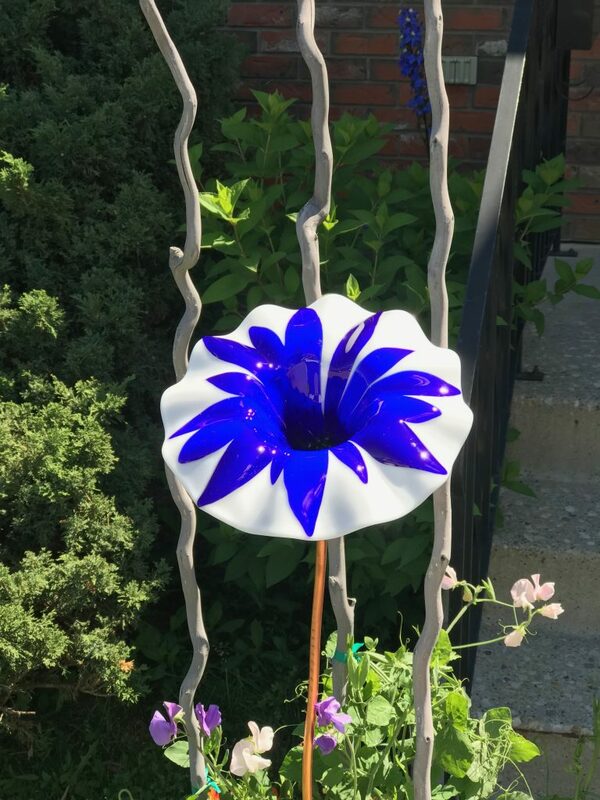 The Flowers are on Copper Tubing and are great for in your Garden. 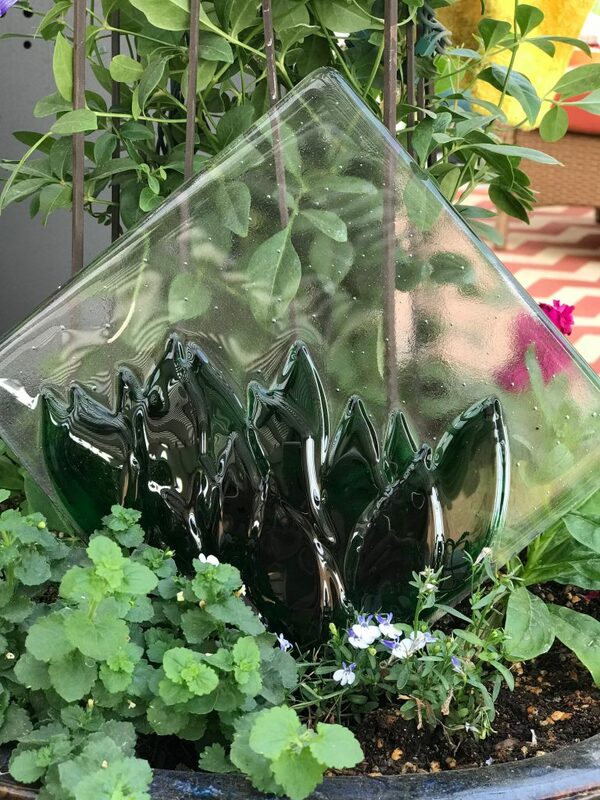 Or as a friend of mine said, she wants to put them into a vase and can I make her some leaves to put into it with them – so another project. 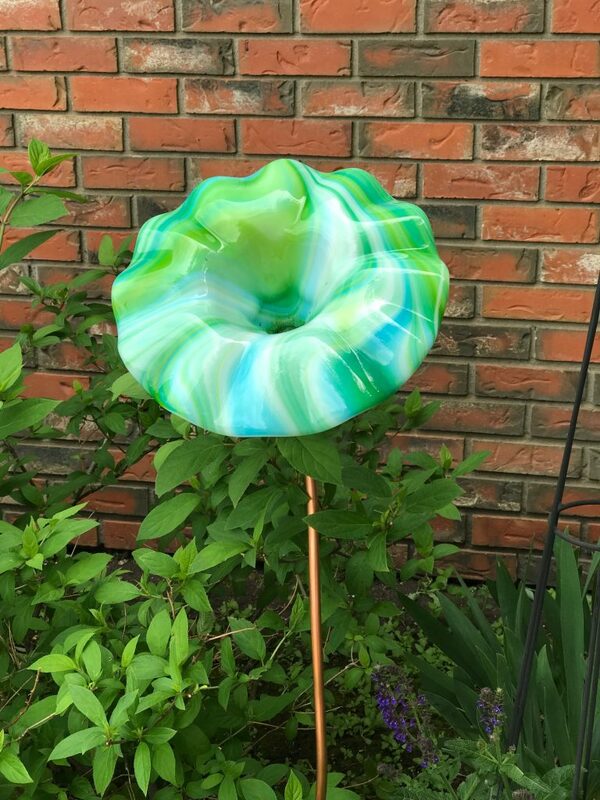 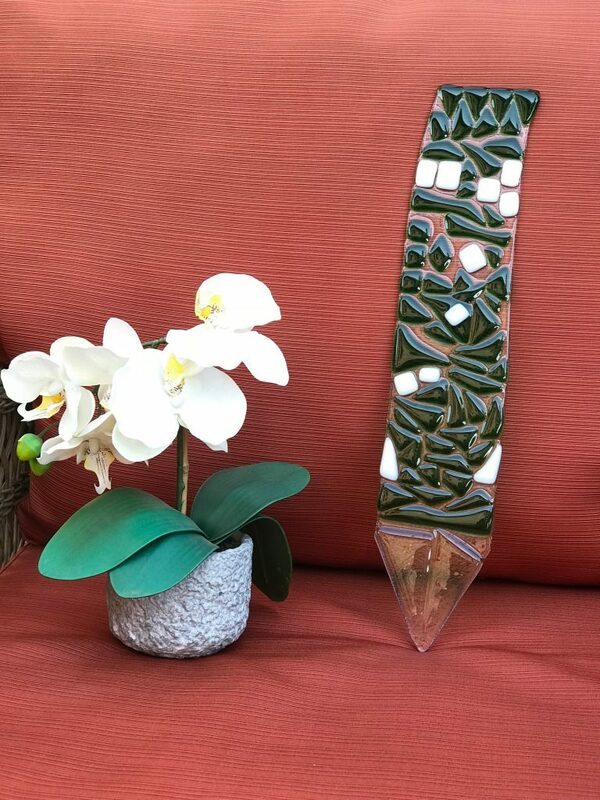 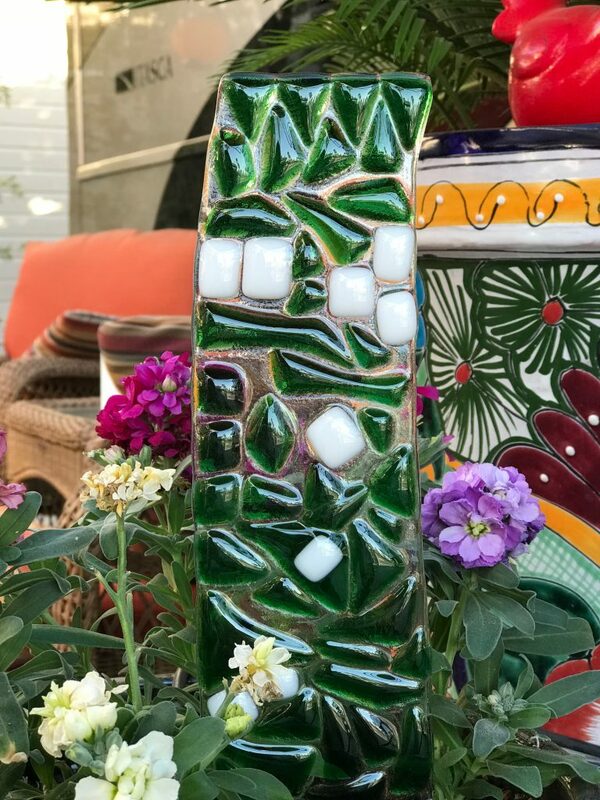 This Flower is made out of Green Reservers Fusion Glass, we added copper tubing to hold it up so you can put it into the dirt in the garden or container. 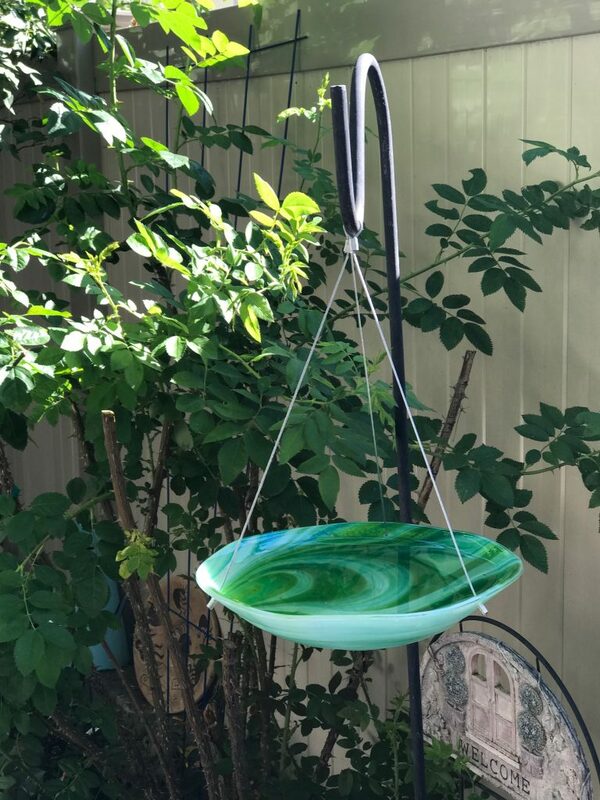 This is my first Bird Bath I’ve made and I’m really pleased with how it turned out. 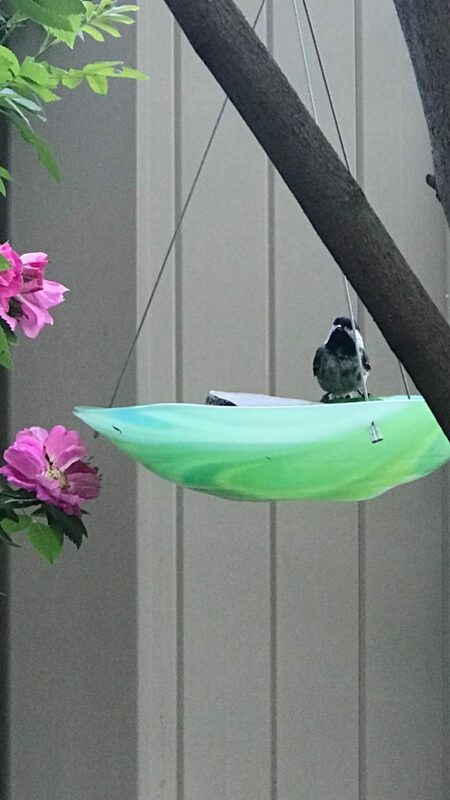 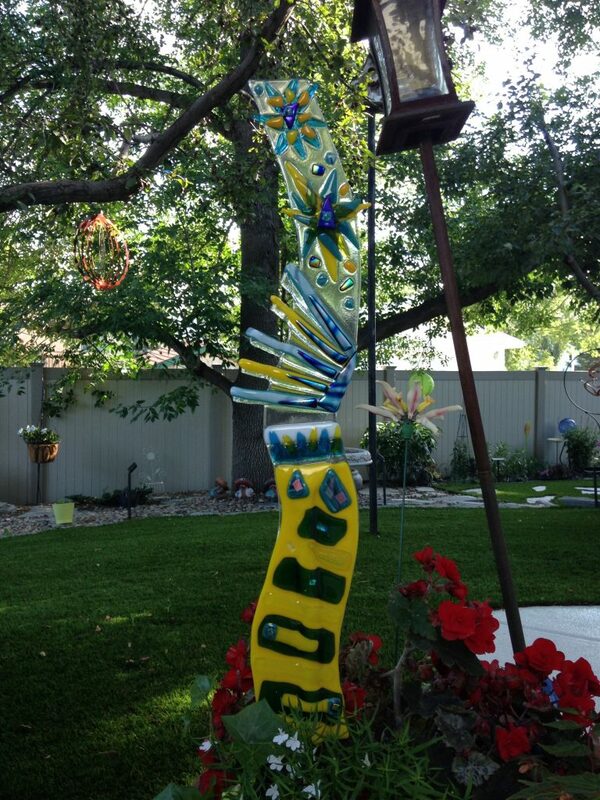 My Wind Chimes are always beautiful to have in your Garden!!! 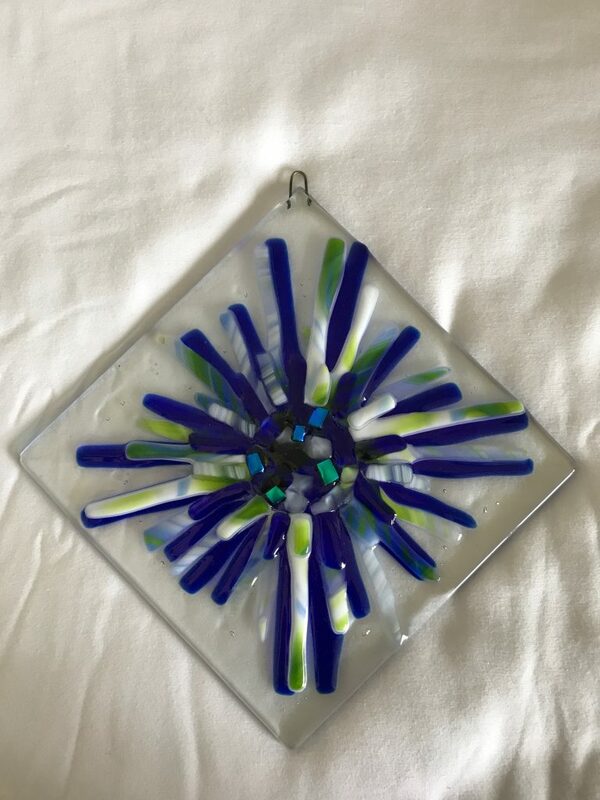 This one I just wanted to have fun making it and use as many colours as I could. 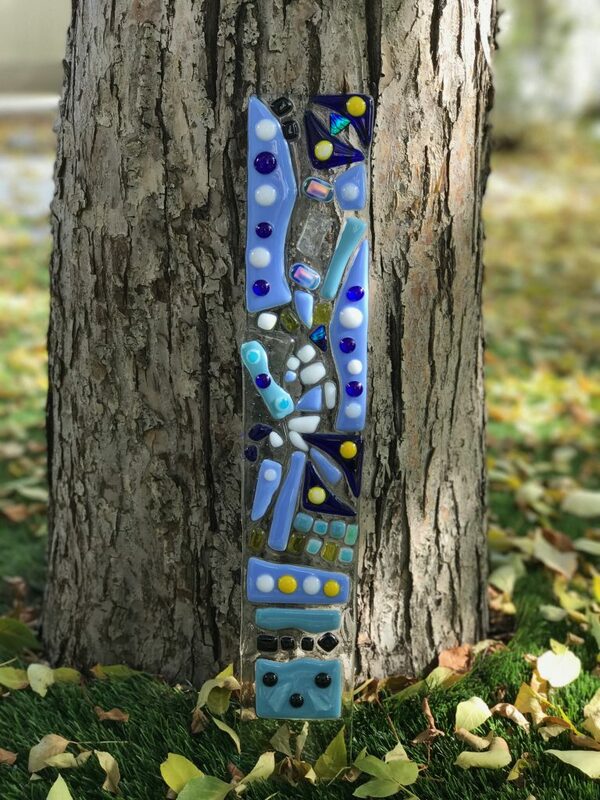 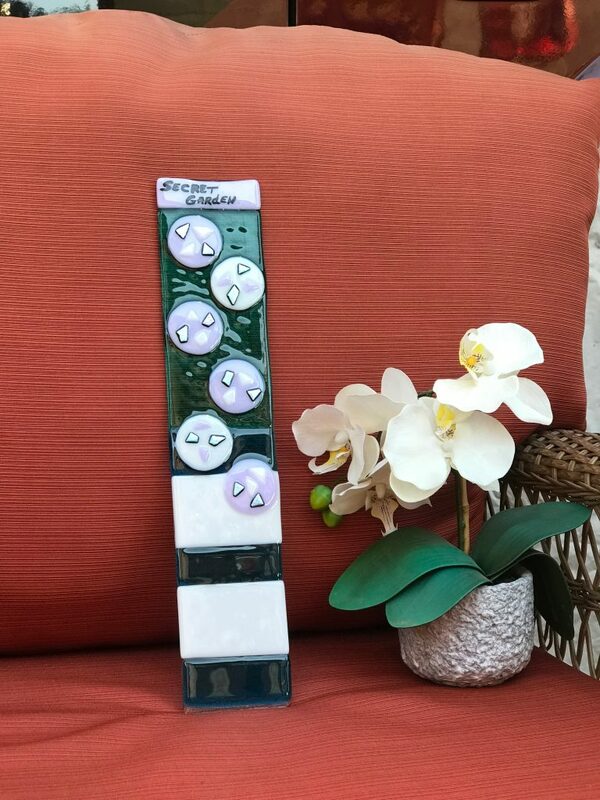 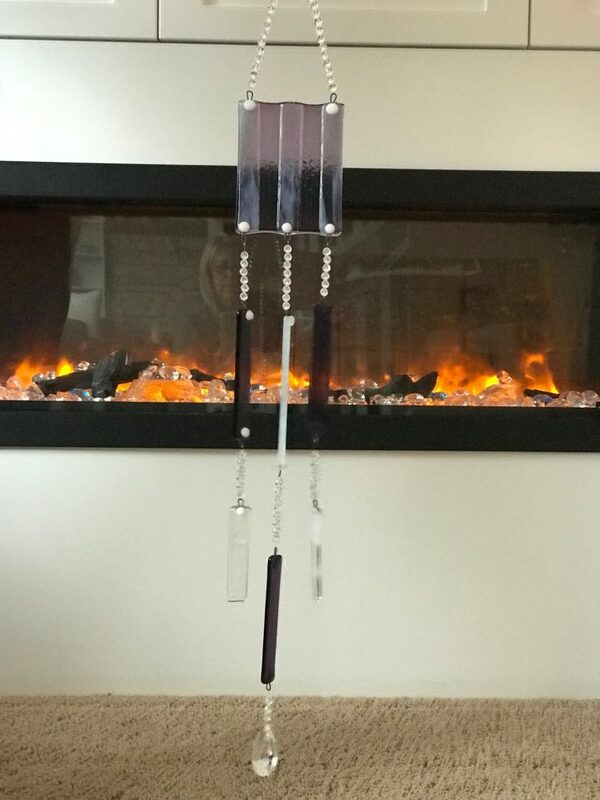 You can Purchase the Wind Chime below or you can have your own Custom Wind Chime made. 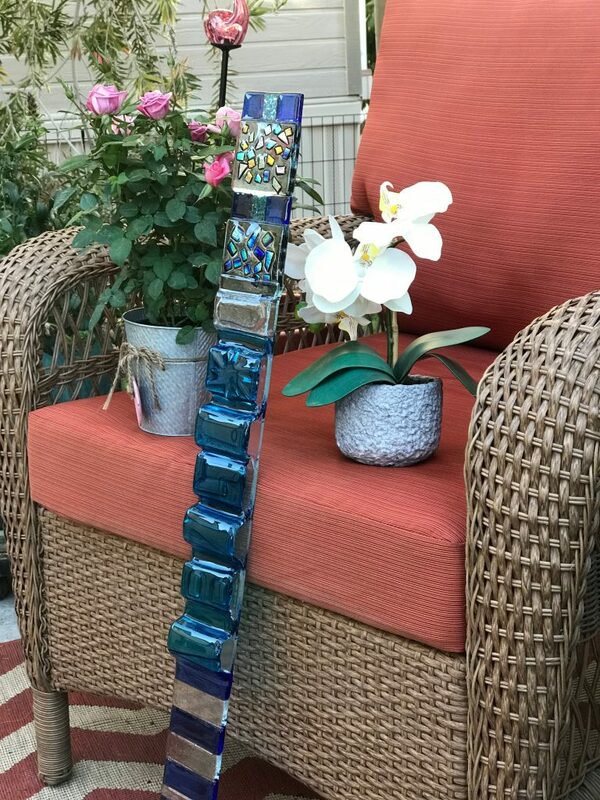 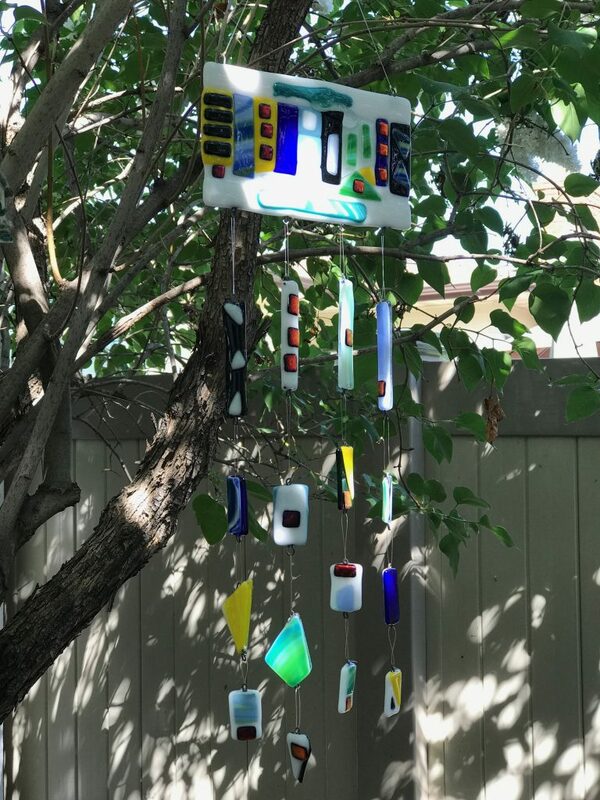 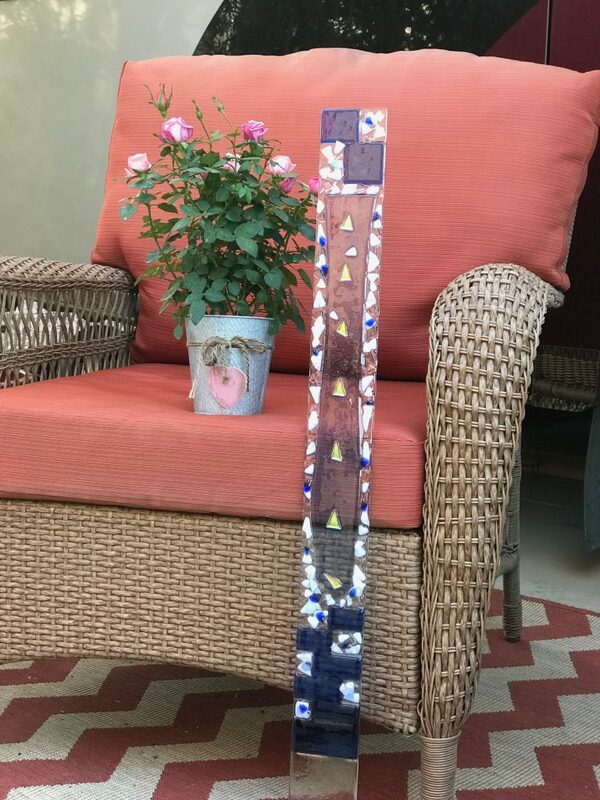 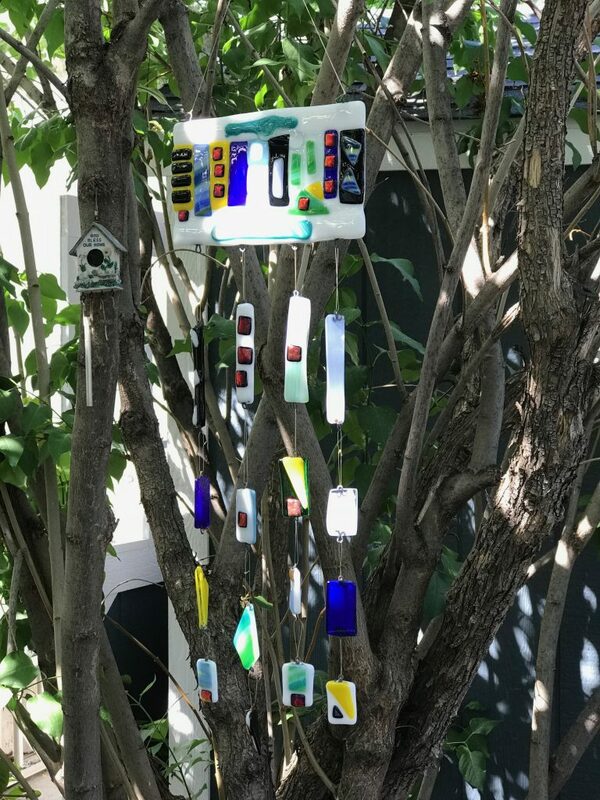 All of the Wind Chimes below are sold – I’m always doing new one’s or I can make one just for you!!! 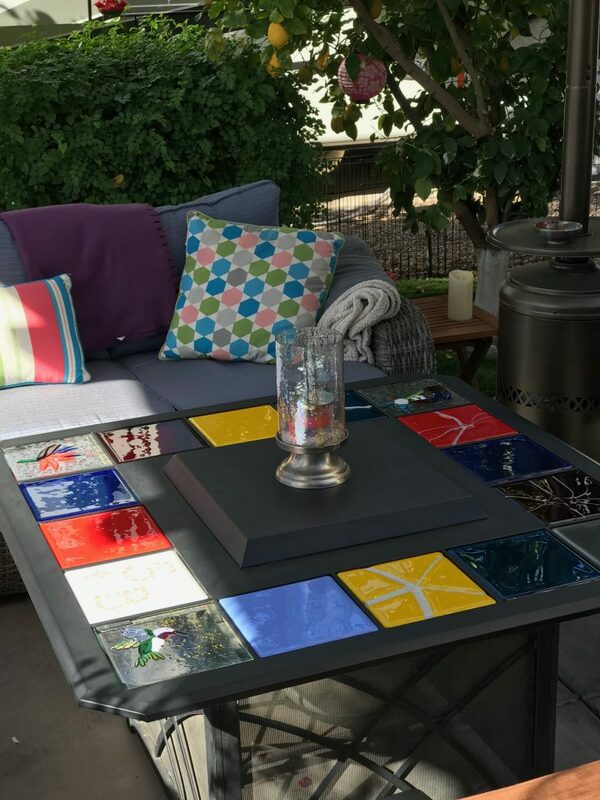 The Fire Table below was a table we purchased that had plain blue ceramic tiles around the fire pit. 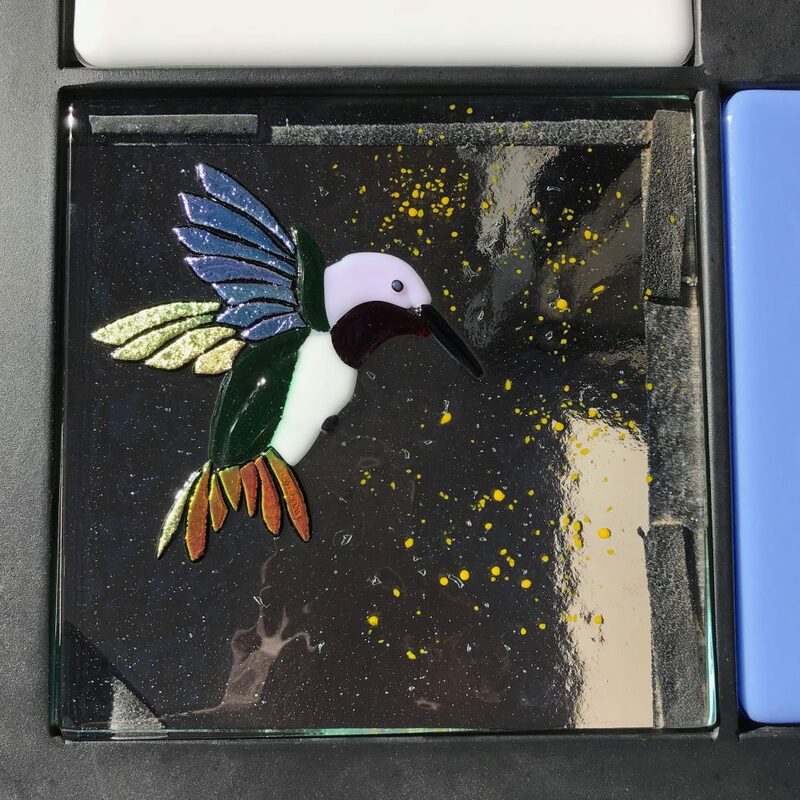 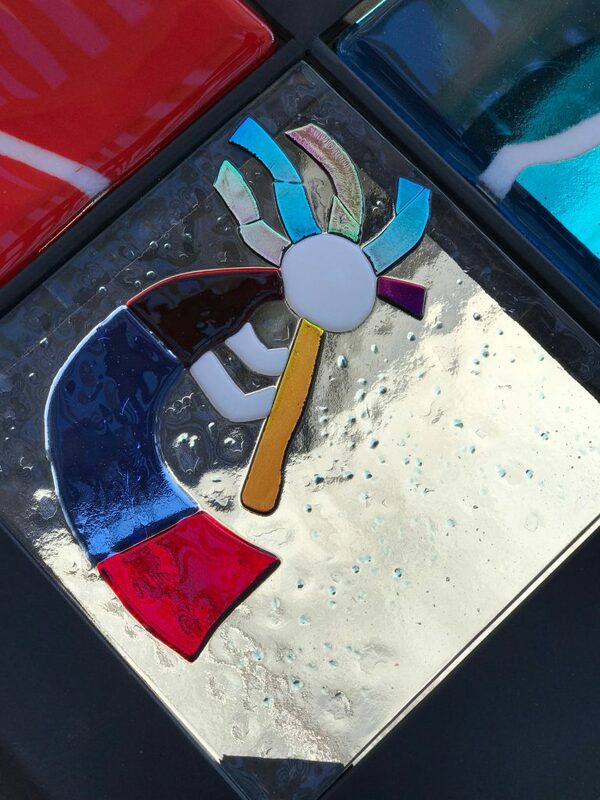 I decided I wanted to change the tiles to glass tiles with some colour and then a piece of art on the four corners. 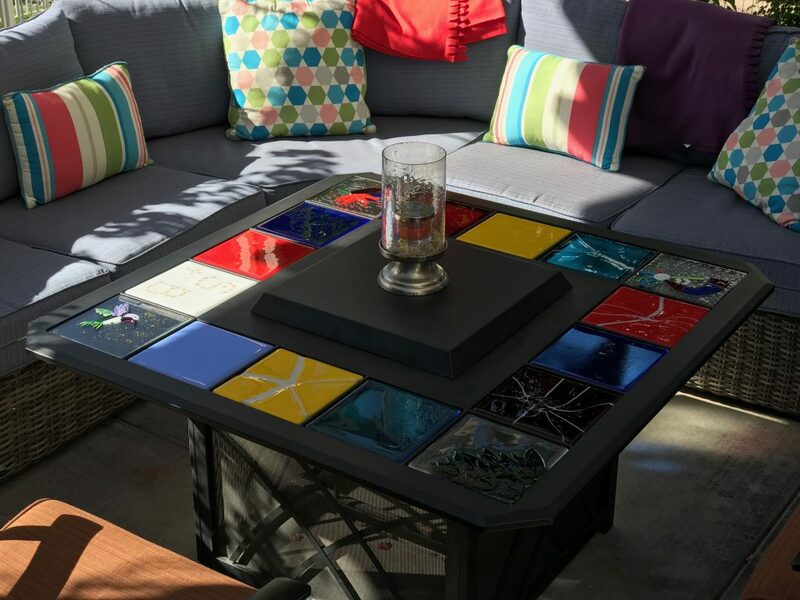 Because this table is in Arizona I decided to go with a lot of colour. 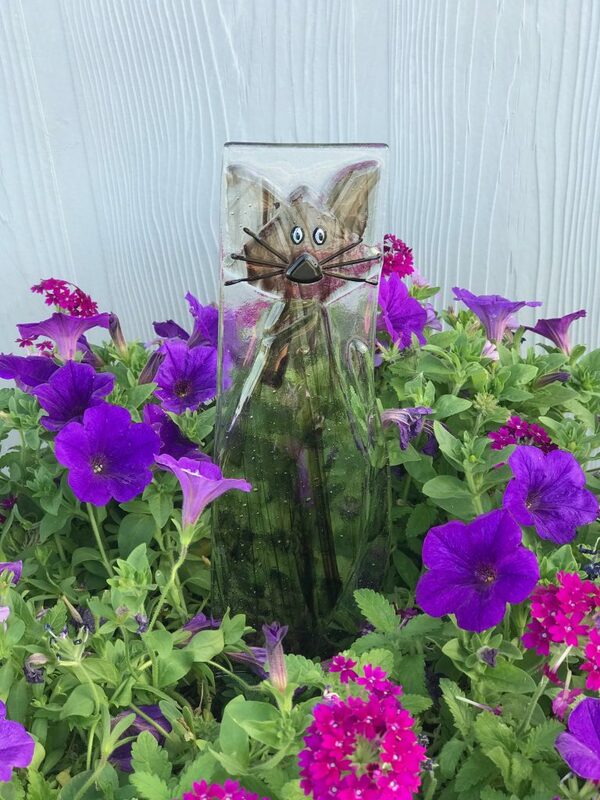 The Garden Stake below, I made for a friend who loves cats and has Miss Lily who is a special Cat. 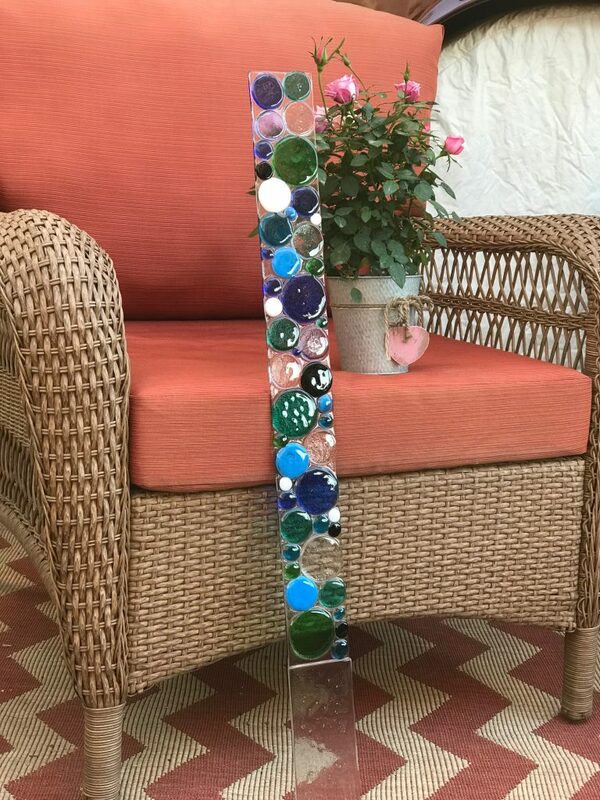 If you love Cats this is the Garden Stake for you, just let me know what colour you would like your Garden Stake Cat to be and I will custom make it just for you. 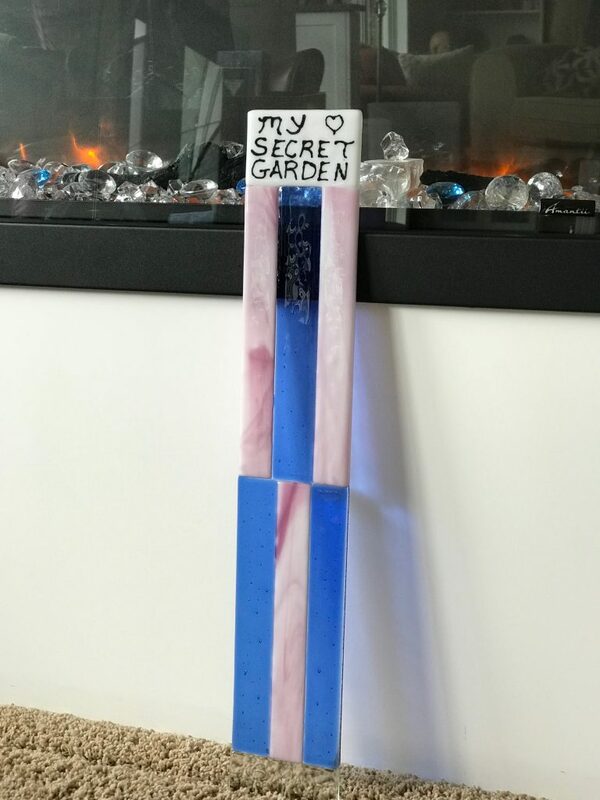 The Garden Stake below is long and wavy – I used mostly transparent colours and pops of colour . 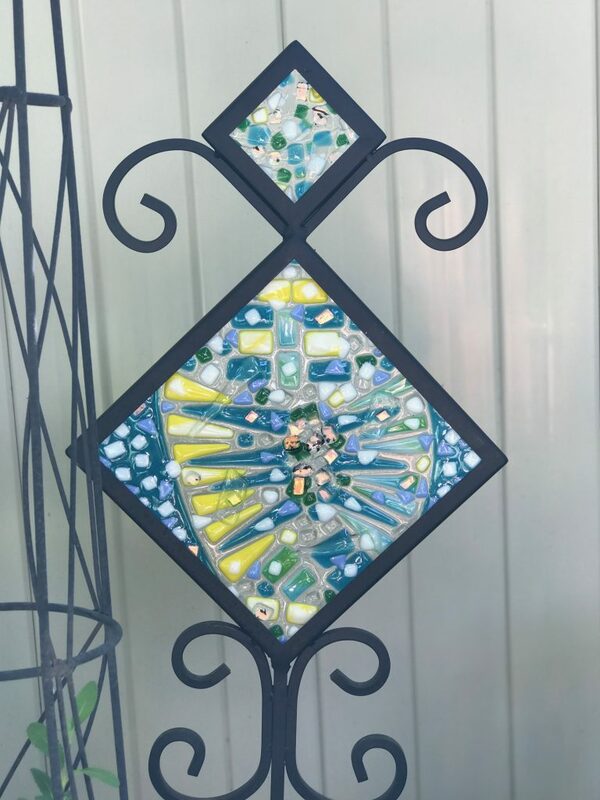 Sun Catcher – I love the colours in this piece – it really stands out when the Sun hits it. 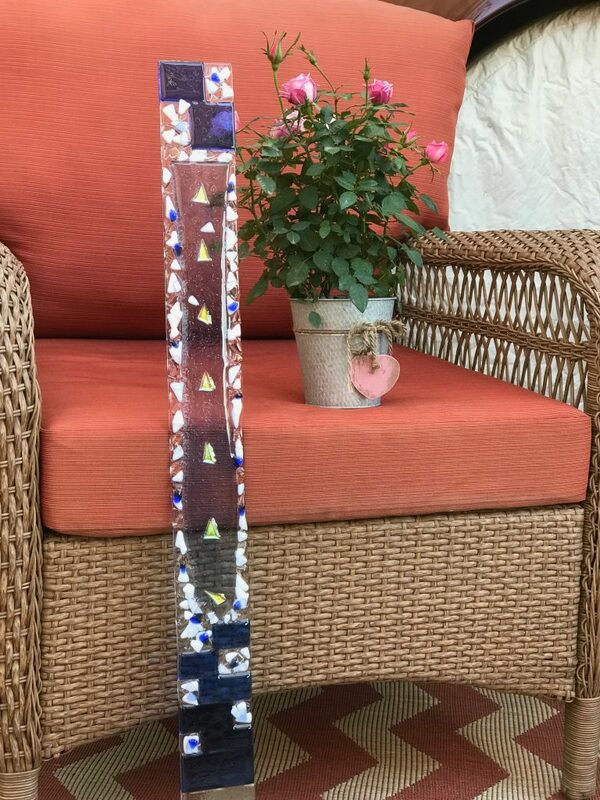 When making my Garden Stakes I love using Transparent Colours as the Sun can shine through and they look beautiful especially with your flowers. 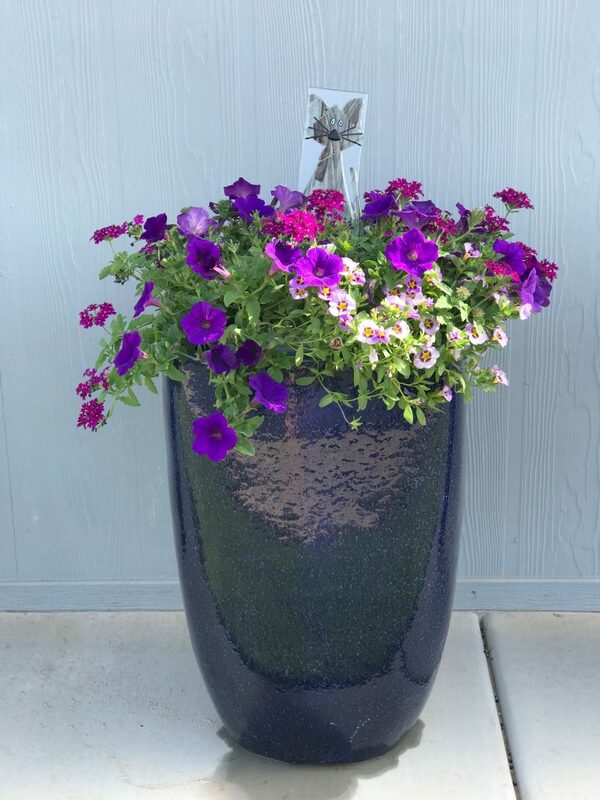 Whenever I do container gardening I always like to have one flowering plant that is my star as I call them and then I work around that one star.